(Bloomberg) -- Fullbeauty Brands Inc., the women’s plus-size retailer, is on path to set a record for fastest U.S. bankruptcy after taking less than 24 hours to win court approval for its plan to restructure the company. The company had support from all its stakeholders when it filed for Chapter 11 status on Sunday in the U.S. Bankruptcy Court in White Plains, New York. 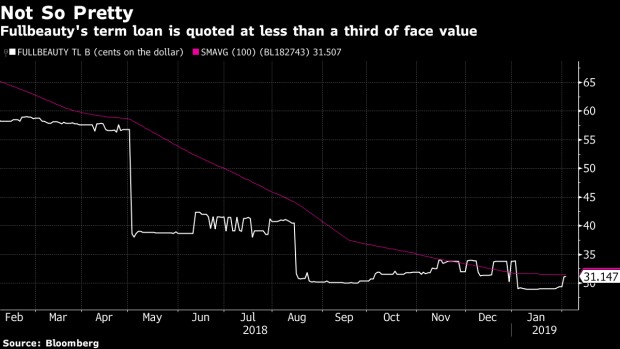 Fullbeauty, which had more than $1 billion of borrowings, is cutting around $900 million of debt through the bankruptcy process, allowing it to cut the cash it has to funnel toward interest payments while it turns itself around. Judge Robert Drain said there were good reasons to approve the company’s plan promptly, including that every creditor had voted for the plan, and that the company has foreign suppliers that may not be comfortable selling to a company in bankruptcy. He gave verbal approval for the plan and said he would sign an order officially confirming it on Tuesday morning. The previous record for the fastest Chapter 11 process is held by Blue Bird Body Co., which exited bankruptcy in 2006 in less than two days. Months of negotiations with creditors and sponsors Apax Partners and Charlesbank Capital Partners led to a forbearance agreement that allowed Fullbeauty to prepare documents and financing ahead of the filing date. As part of the restructuring, senior lenders including Oaktree Capital Group LLC and Goldman Sachs Group Inc. are putting in more capital and get a majority equity stake. One advantage for Fullbeauty is that it doesn’t have stores to worry about. The company sells online and through catalogs, which frees it from having to evaluate which outlets it needs to close. Fullbeauty faces competition online from Amazon.com Inc. and retailers including Kohl’s Corp. and Walmart Inc. that have entered the plus-sized clothing market, which the chain defines as women’s sizes 12 to 44. Profitability also was hurt by low supplies of basics clothing, heavy discounting and inventory clearance, Bloomberg reported. On top of competitive pressures, Fullbeauty was saddled with more than $1.2 billion of debt, and it struggled to keep up with interest payments. The New York-based retailer told investors in late October that it would skip a payment on its $345 million second-lien term loan, Bloomberg reported. The forbearance agreement with creditors followed, along with a tentative accord to rework the company’s debt and cut leverage. --With assistance from Dan Wilchins and Steven Church.